Currently, the popularity of finishing natural stone is very growing. The reasons for this are many. But natural stone is expensive. But to help lovers of beauty came artificial stone. It allows much cheaper to decorate your country home, cottage. Modern technology helps to completely simulate the texture, shape, color real natural stone. Very often, to distinguish natural stone from artificial can be difficult. Make faux rocks made of cement, expanded clay and natural dyes. The prepared mixture was poured in special molds. But in addition, artificial facing stone has many advantages. First, it is lighter than its original brethren. So the walls will be easier to withstand the load. 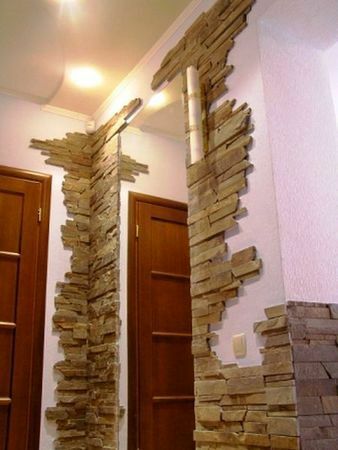 Artificial stone you can stick on any surface (wood, metal, brick). Decorative stones do not burn or give off smoke when heated. So you can use them for the decoration of fireplaces and stoves. But do not keep the stones constantly under high temperature. Due to the constant heat change dyes, and the stone crumble. In the end, the facade or decoration of the house will lose its beautiful look. Another of the advantages of this finishing material is that its reverse side is flat, then the bonding process is easier. This procedure can handle even each of you. First, align the surface, otshtukaturili it, and then apply the glue. If you stick on a wooden surface, first the Foundation should be blagosklonov and attach the metal mesh. To glue the artificial stone prepare cement mortar with glue. Use the glue for exterior or glue designed for working with tile and stone. If necessary, the size of the stone can change - it is easy to cut with a grinder. There are two ways of gluing a facing stone. First — stick stone with jointing seam. If you're going to glue with this method, the stones attach to each other at a short distance. As a result, you'll save material. If you select the second method is seamless, the stones attach to each other closely. Do not spread the surface with stones of different textures and colors. Should not two of the same item to place next to each other. For the seams use a colored putty or colored sealant. For cladding corners use corner units.